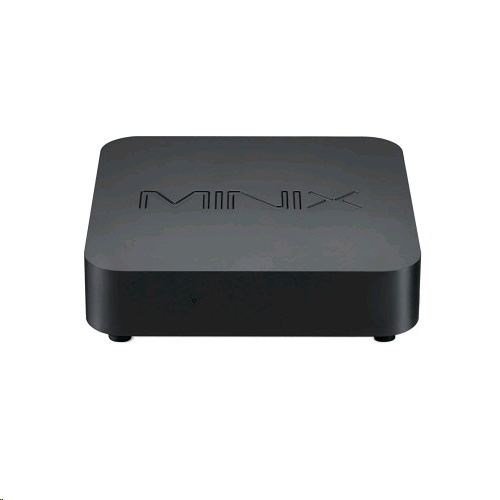 Fully Functional, Customisable Mini PC with Windows 10 Pro (64-bit) Pre-installed. 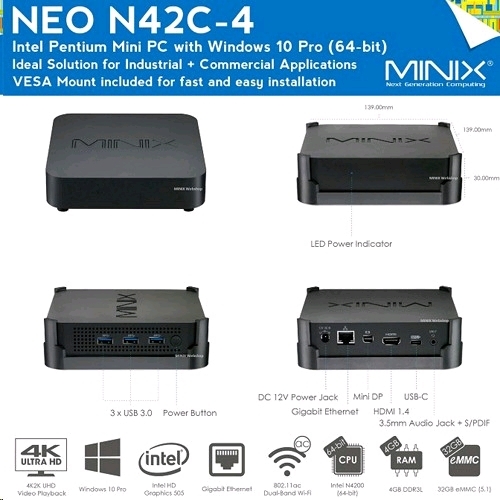 NEO N42C-4 delivers all the power and functionality of a desktop computer in a compact, stylish chassis. Powered by Intel N4200 processor with integrated Intel HD Graphics 505, NEO N42C-4 is ideal for industrial and commercial applications; Digital Signage, POS and Thin Client solutin. Its sleek and understated design allows for easy integration in any places with limited space, while still achieving premium, ultra-responsive performance and the power to fulfil your productivity needs. Pre-installed with Windows 10 Pro (64-bit), set up is effortless and NEO N42C-4 is ready to run straight out of the box. Ultra-High Definition 4K @ 60Hz & Triple-Display Ready. Thanks to its Intel HD Graphics GPU engine, NEO N42C-4 excels at producing super detailed, crystal-clear 4K @ 60Hz imagery; capable of streaming Ultra-High Definition vibrant visuals smoothly. NEO N42C-4 is Triple-Display Ready, allowing easy connection for up to three displays via the HDMI, Mini DisplayPort and USB-C outputs. [Important Note: The integrated USB-C port only supports video output, not audio output]. 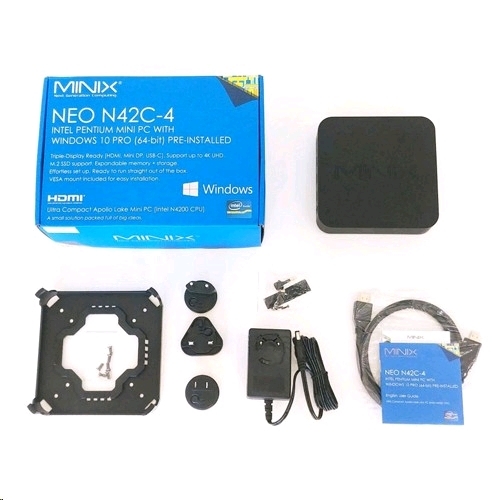 NEO N42C-4 comes with 32GB eMMC internal storage and 4GB of DDR3L, while the inclusion of a 2280 M.2 slot [SATA 6.0Gbps] and a pair of SODIMM slots [dual channel support] offer the flexibility to expand the storage and RAM to meet user's requirements. The 2280 M.2 slot [SATA 6.0Gbps] provides storage expansion up to 512GB, and the pair of SODIMM slots support up to 8GB of DDR3L memory each. Integrated USB-C Port. NEO N42C-4 is equipped with a vast array of connectivity options: Three USB 3.0 Ports, HDMI [4K @ 30Hz], Mini DisplayPort [4K @ 60Hz], USB-C [4K @ 60Hz], Optical S/PDIF, 3.5mm Audio Jack, 802.11ac Dual-Band Wi-Fi, Gigabit Ethernet and Bluetooth 4.1. 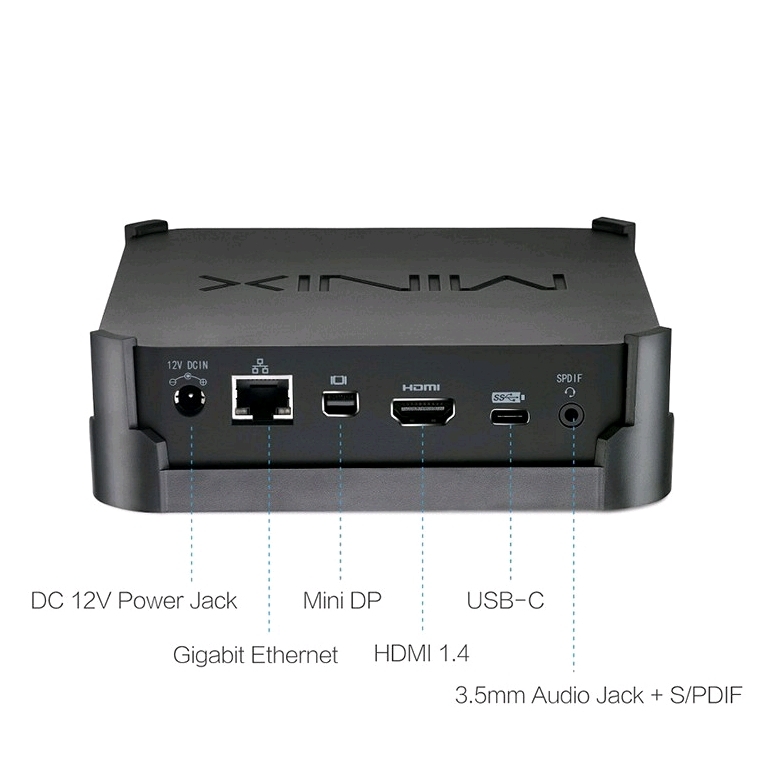 [Important Note: An active adapter is required to convert Mini DisplayPort output to HDMI/DVI output]. The integrated USB-C port supports ultra-fast data transfer, video display output up to 4K @ 60Hz and simultaneous power input. [Important Note: USB-C power input is optional, standard DC 12V, 3A power adapter included]. NEO N42C-4 employs an active cooling solution to ensure safe operation and stable performance even throughout prolonged operation, while producing absolute minimal noise to guarantee zero disturbance during usage. The chassis also incorporates cleverly designed ventilation and air holes to maximize airflow, and maintain appropriate temperature to safeguard against over-heading. Built in accordance to industrial standards, NEO N42C-4 is highly reliable throughout periods of continuous 24/7 operation. An auto power-on option can be enabled within the BIOS menu setings, removing the need to manually power back on atier a power outage. NEO N42C-4 includes a VESA mount for easy installation on the back of a VESA compatible TV or monitor, no tools are required for mounting once the included bracket has been installed. The VESA mount gives full access to all ports and power button, and does not affect the Wi-Fi or Bluetooth performance; Eliminating the cable clutier of a traditional office setup.